Quick and easy healthy recipes are a must-have in the realm of entertaining. Sometimes it is a spur-of-the-moment get-together that takes you unaware - but you don't have to panic! Knowing that you can create wonderfully simple yet healthy dinner party menus is a gift that we can all give ourselves so that we have less stress and more time to enjoy what really matters - our friends and family. Sometimes it is okay to experiment and go 'all out' with labor-intensive menus for dinner parties, but most often it is the quick and easy menus that we put together that are the most memorable - at least for our guests, but probably for us, too! Substitute blue cheese for this wonderful appetizer or even feta - several cheeses go splendidly in this recipe. Prep time is 15 minutes max and cook time 4 minutes. Combine cheese, butter, liqueur, pepper and walnuts in small bowl and stir until blended together. Spray the grill rack with cooking spray - place bread slices on rack and cook about 2 minutes per side until lightly browned. 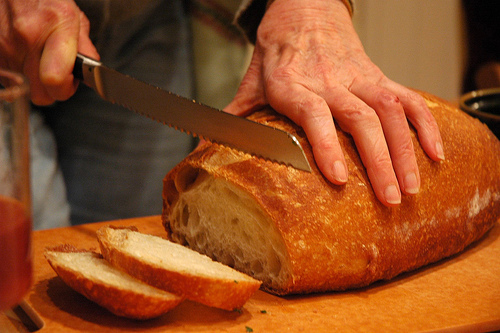 Remove from grill and rub with garlic - either roasted or cut edges of garlic on 1 side of each slice of bread. 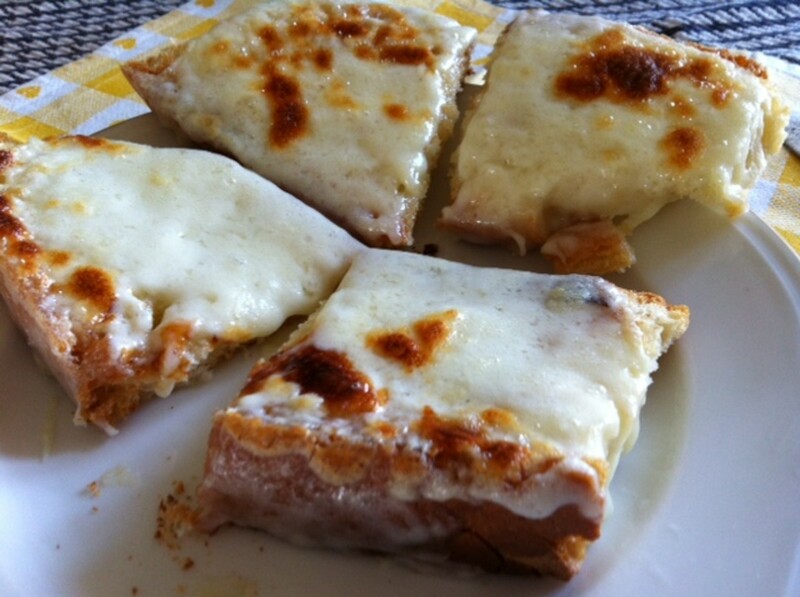 Place about 2 teaspoons of cheese mixture on bread slice and serve with apple wedges (2 slices of apple per toast). This is a great appetizer because of the combination of cheese and apple with walnuts but it also gets the grill fired up for the main entree! Prep time is about 8 minutes. Mix together minced onion and vinegar in small bowl - let stand for 5 minutes. Add olive oil, salt, peper, Dijon mustard or any other seasonings - mix well with a whisk. 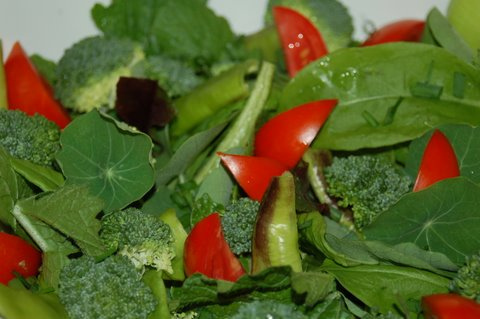 Place lettuce, sliced onion and tomatoes in a large salad bowl. Toss gently to combine ingredients. Drizzle vinaigrette over the salad - toss again. 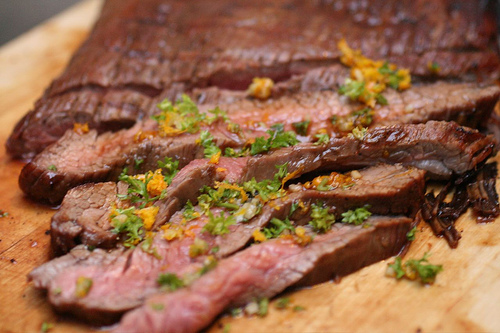 This is a delicious pesto type flank steak done with a pesto of pine nuts and cilantro. Prep time is about 13 minutes and cook time the same. Place cilantro, pine nuts, jalapeno, salt, pepper and garlic to blender or food processor. Process until finely chopped (15 seconds or so). Add yogurt and juice and process again until smooth. Cut steak diagonally across the grain into thin slices. Serve with pesto sauce. Substitute almonds for pine nuts. 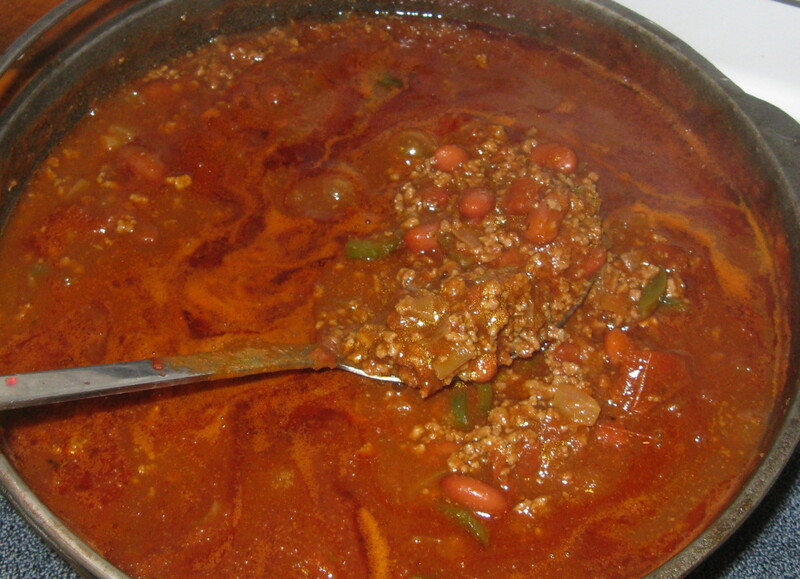 Place nuts in a small nonstick pain over medium heat and stirring frequently, brown in dry pan. Take off when lightly toasted - after about 2-4 minutes max. Prep time is about 14 minutes and cook time 8 minutes. 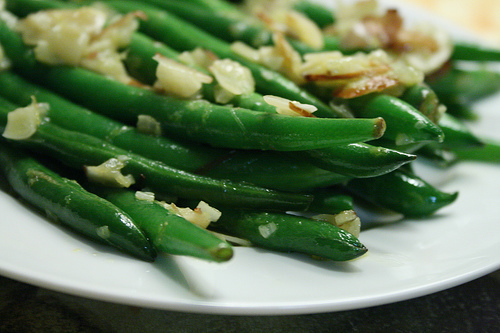 Steam green beans for 7 minutes covered or until crisp-tender. Drain and return to pan. Add parsley and remaining ingredients. Prep time is 20 minutes if making Watercress Sauce, cook time 35 minutes. Potatoes should be started after bruschetta is made, while other foods are cooking or being put together. If making watercress sauce, make that while oven is heating and put in fridge to chill. 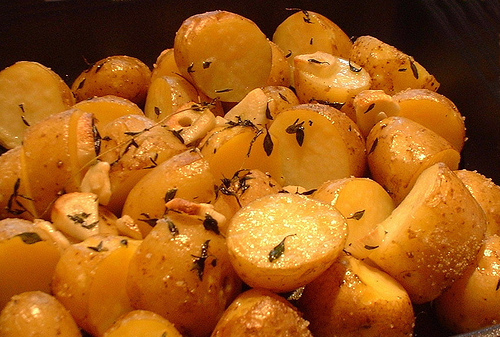 Combine potatoes, olive oil, salt and pepper in a bowl or in a zip-lock bag, turning to coat potatoes. Turn out onto a pan coated with cooking spray. Bake at 450 degrees for 35 minutes or until tender, turning occasionally. Place all ingredients in blender or food processor and blend until smooth. Cover and chill. This is a marvelous end to a great meal. Prep time on this recipe is about 7 minutes, cook time 3 minutes. Combine coconut milk, skim milk, sugar, tapioca and egg substitute with salt in medium saucepan and let sit for 5 minutes. Bring the mixture to a boil over medium-high heat. Stir constantly. Remove from heat and stir in the vanilla. Divide the mixture evenly if desired between 4 bowls. Cover and chill until thickened. If desired, serve with light cookies or a bit of fresh fruit. Substitute unsweetened soy milk for coconut milk if unavailable or if desired. Substitute whole milk combined with 1 teaspoon coconut extract. If unsweetened coconut, add 1-2 tablespoons of powdered sugar - then toast in 350 degree oven for 2-4 minutes, stirring every 30 seconds. 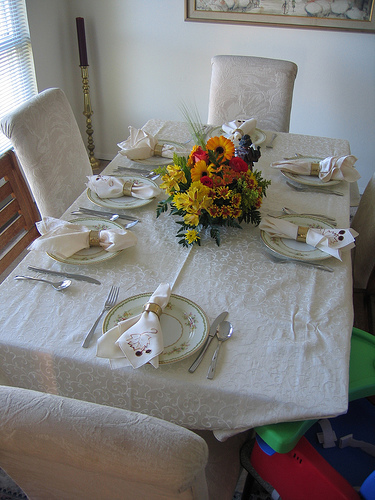 Having a dinner party doesn't have to be a major stressor. As you can see, this dinner is relatively simple and all the dishes are super easy to make and require very little in the way of time. In preparing dinners of any kind on any occasion, it is all about getting things together at the same time. Having dishes and foods that blend with each other and that are easy to make simultaneously or one after the other really helps - it all depends on the prep involved with each dish. These recipes are all very simply done but delicious and healthy parts of a great dinner party. One thing I try to do when I'm cooking for dinner parties and I know that there will be unexpected delays or distractions is to try and 'prep' as many foods the day ahead or earlier in the day as possible. For instance, if there are things that need to be chopped or blended that can safely sit in the refrigerator until time to cook or put them together, I have them in small bags or bowls labeled and ready to go. That cuts down further the cooking time along with the anxiety factor of trying to do too many things at the same time. I also set my table or put out my dishes/plates so that I know where things will go ahead of time so I don't have to forage around at the last minute to make it all work. Sometimes being prepared is the best gift you can give yourself! Entertaining is a favorite hobby of mine and I love trying out new and delicious recipes on friends and family. The key is being organized and then keeping it fairly simple. No one likes a stressed hostess or cook! I try to remember that the main reason I am cooking is because I love to but then because I love these people. My motto when I'm cooking is to just enjoy it and relish the time I have to spend with people I love. It also is about creating easy and pleasing recipes that people want to take with them! The main goal is enjoying the food and the ambience - If you can come up with quick and easy, pleasing meals to boot, it's all the more fun! Entertaining is very easy when you set up a buffet with make ahead recipes: for soups, salads, sandwiches, and tostadas. These four party choices are fun, quick, simple, and delicious. Find recipes, hints, tips, and great ideas for easy entertaining. Looking for fun dinner parties? 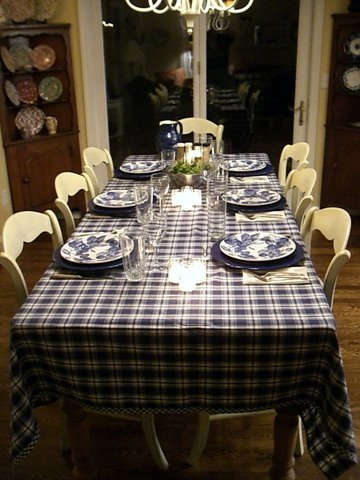 Anyone can host a successful, quick and easy dinner party with these ideas! Dinner parties don't have to involve an overwhelming amount of work or cost a fortune. Try these easy and frugal ideas, and enjoy hosting your dinner party. Planning a holiday gathering? Ina Garten shares some time-saving tips for preparing festive fare. Check out the recipes. Easy Dinner Recipes for the Perfect Dinner Party. 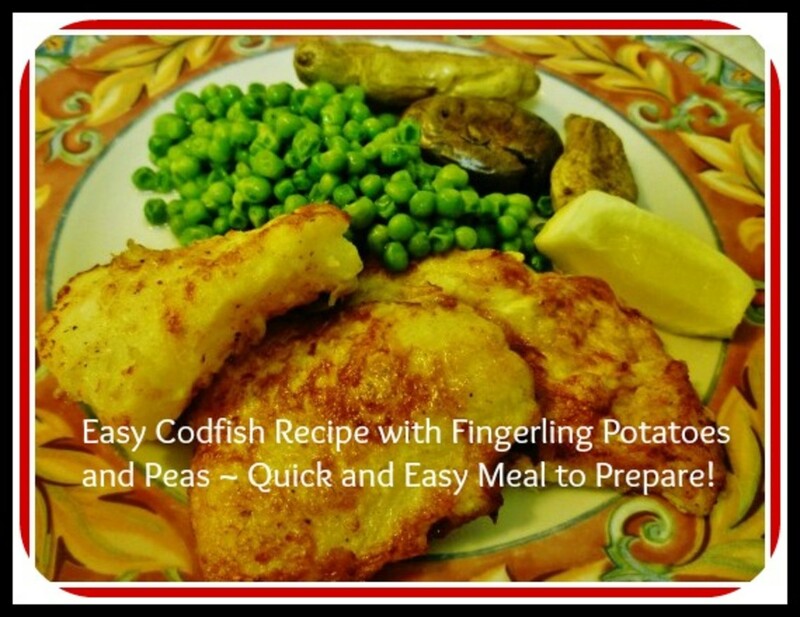 Tried and tested easy dinner recipes designed for maximum effect but with minimum effort...selected by a professional Chef! Roasting a small, pre-marinated pork roast on the grill makes a delicious meal with surprisingly little effort. Add seasonal veggies and serve with salad for a simple dinner party. JJ - Thanks so much for wandering my way - and sounds like a good thing to do! Nice job on this hub! I was just wandering through hubs when I stumbled upon it! I love entertaining and cooking, and right now, I may need to call up a few friends for dinner! Thanks for sharing! Thanks for stopping by t2webnetwork and hope you enjoy it! Wow! Just doing a search for some healthy recipes, I want to make all of these! I honestly think I'm going to try the flank steak tonight. 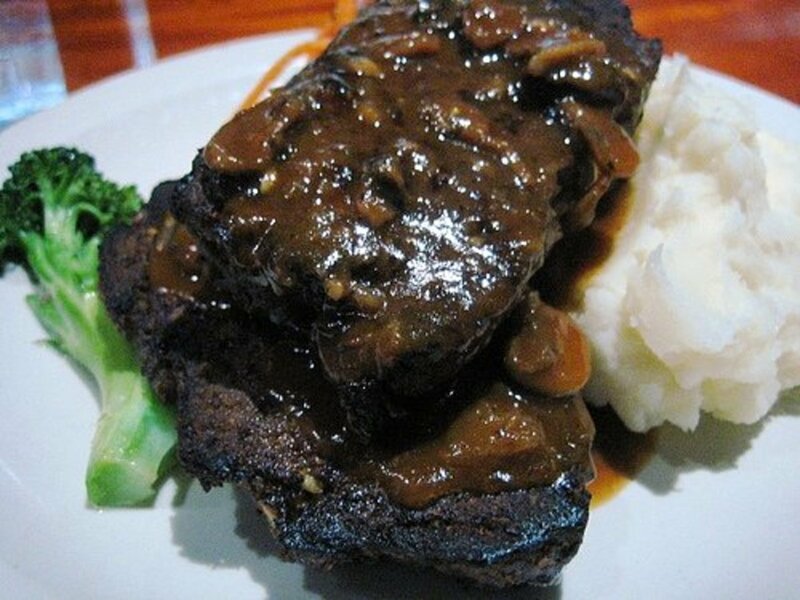 Thanks myawn for stopping in and hope you enjoy it at your next quick and easy dinner party! The salad looks good and the steak is nice too. I will try the steak next party I have. 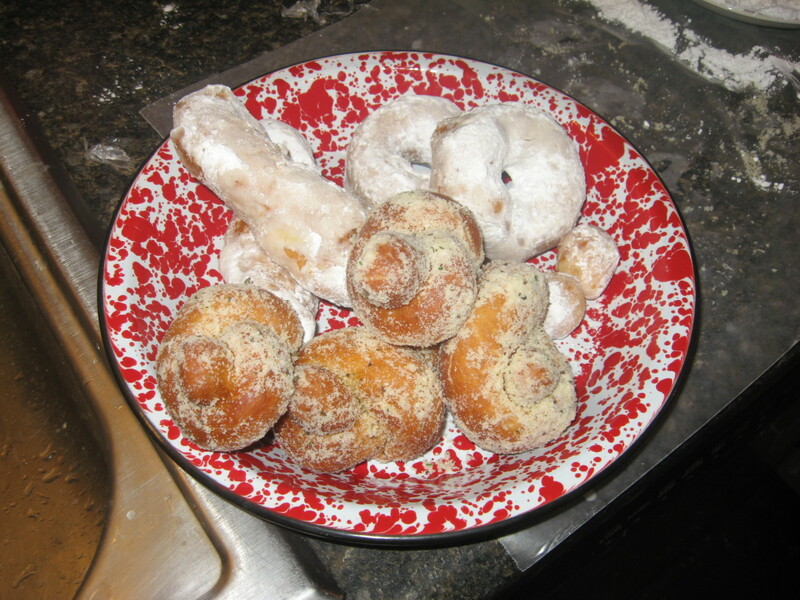 Koffee Klatch Gals - You are welcome and hope you enjoy them! Holle, the door's always open and the light's on! Griffin is waiting too and hopefully I can keep the tapioca out of his greedy big paws! Yum! Can JOhnny and I come?? Wonderful hub - detailed, beautiful pictures, and devine recipes. I am bookmarking this site to use next time I have a house full of people to feed. This really is quick and easy. I'm afraid I would fill up on the bruschetta and not have room for the rest. Sounds yummy! MPG - I never say anything I don't mean! Steph - I know - any time! I love to cook and I love to do many things- it keeps me from being senile! Great, I'll work out a date and be there! Any time! 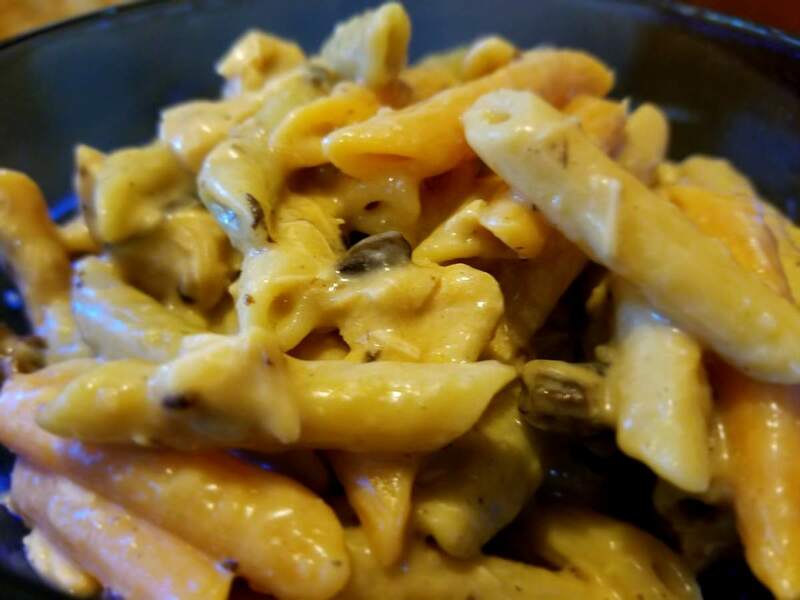 I am always up for cooking for other people - it just gets too mundane after you do it for just the 2 of you....even when we had the kids at home, it was still fun because I love to cook and I love to entertain....so stop on by! The bruschetta sounds wonderful, have to try it for my next dinner party. Oh wait, I've haven't hosted a real adult dinner party in years! See what having kids does to your creative cooking side. Seriously, great hub, beautiful pics and so glad you love Italian food. Could I join you for dinner some time? Thanks so much for coming by Prosperity66....I'm glad you like the recipes - they are all delicious! I'm wowed! Lots of interesting recipes on this page; which I'm saving on my computer so that I can get back over and over again. BJ - It's never too soon because I'm always cooking so there is always something! And if not right at my fingertips, I tend to have enough in the freezer to whip something up! Would love the company - it gets pretty boring here in this 1-horse town! Thanks, Pamela! All this writing about food makes me hungry, too! akirchner, Many fantastic recipes for a dinner party and the pictures of course, made me hungry. I am bookmarking this site. Rated up! a - Would tomorrow be too soon? Thanks, Sandy - it is pretty easy yet delicious. The photos look good too! 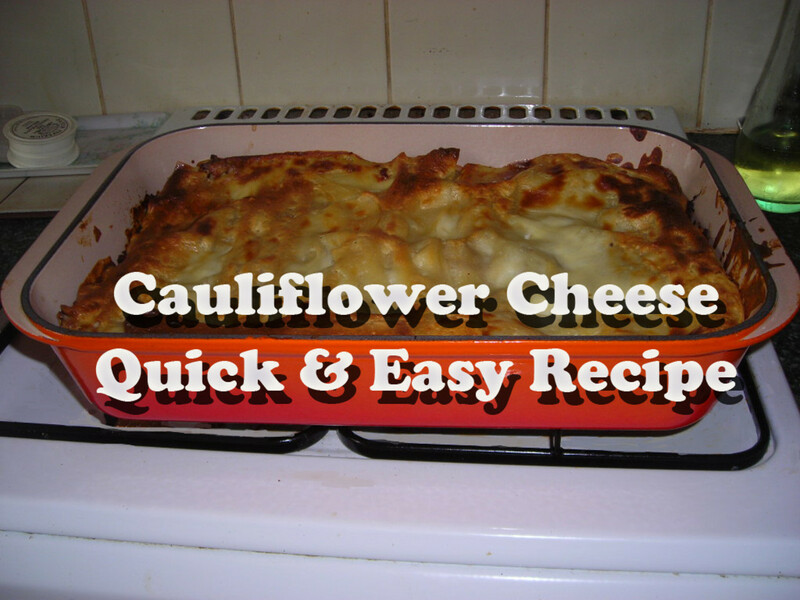 This looks like a delicious meal and being quick and easy...awesome! Thanks you, Prasetio - of course I have more! Those recipes and ideas for cooking just are second nature for me but thanks so much for all your kind words and for stopping in. Anytime you are hungry, just drop on by. Hello, hello - I do love it - not sure about the 'great' part but I do hae fun doing it! Your a great cook and hostess. Thank you for all these tasty recipes. Wow.....you make me hungry, my friend. Do you have some more for me? I got various delicious recipes mix with useful tips. Most of them contain healthy ingredients. I also enjoy all the video. Good work, my friend. I rate this up. Thank you very much! There ya go! Most of my friends and family say that...I truly do love to cook so any time, anywhere you are nearby....come on down and I'll test out my newest and brightest recipes on you! Finally, Audrey, a recipe even I can make - grilled flank steak. Looks easy and delicious. It would be difficult to mess that one up. Thanks. Sudden thought - we would be a perfect pair: you like to cook; I like to eat. Why Micky - you just get on that bike and pedal over to my house and you will have the time of your life! I live to cook for other people and I love nothing better than for my house to be filled with laughter and happy people...the food helps but it is mainly just a labor of love as I do enjoy people! Nellie - you crack me up - ANYTHING is a dinner party - even pizza and beer! It is the thought behind it that counts....I just have to have dinner parties because I cook like a fiend and if I don't have an excuse to try all my recipes, what would I do? Poor Bob would weigh 6000 pounds! Zsuzy Bee - Thanks so much for stopping by - and I hope you love it as much as I do....of course I'm a wannabee Italiano so anything bruschetta sounds good to me. I love feta cheese and I tend to totally forget the 'other' cheeses like gorgonzola but it is so good with the walnuts and apples! Enjoy and have a great book club dinner! I absolutely love to host and often have dinner parties. This 'Quick and Easy Grilled Gorgonzola Bruschetta with Walnuts and Apples' looks yummy. 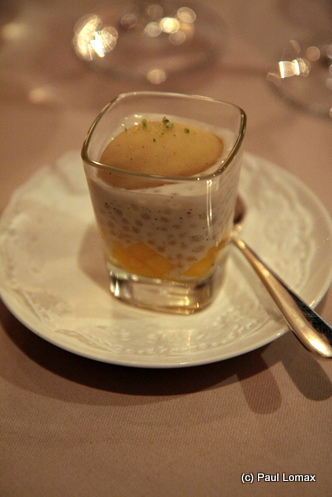 I will try this recipe on July 18th when it's my turn again to host our book clubs dinner. Thanks for sharing. I thought I'd check this out because you wrote it! It's a great hub! However- I don't have any friends!